Thinking to have Yahoo! Mail, Facebook, Skype and Hoovers integrated into Outlook so that you can access them at anytime while working in office environment? 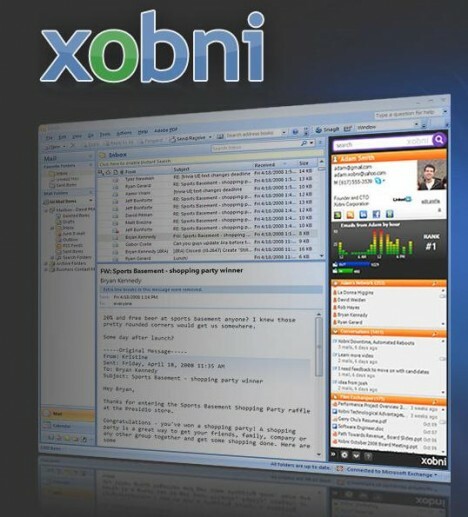 Xobni (see Xobni launch information) is a popular Outlook plug-in will able to meet your needs by collaborating with the internet leading companies so that it provides a one-stop solution for people to obtain, process and react to information in faster and convenience way as well as stay informed with the latest news and connected to the important group of people. It allows users to send instant messages, SMS, perform VOIP (Voice Over Internet Protocol) calls. Besides, users can check online status for Skype contacts easily. It is able to display profile and friends’ pictures, status messages and even recent updates to Facebook profile. It enables Yahoo email preview and respond directly to it. Besides, the Yahoo’s contact lists will be displayed on Xobni sidebar. It is able to display company information from senders based on email domain in Xobni profile. Xobni will automatically run whenever Outlook is launching. It will take some time to sync your email data when it runs for the first time. Xobni plug-in only consumes 11.55MB of your hard disk space and just click here to download Xobni version 1.6.3 at no cost.